Aloe vera is a plant that has been used for the treatment of burns and wounds. The plant is related to the cactus and produces two substances that are used, gel and latex. It can be grown at home and the leaves broken open and used directly on burns. The plant is indigenous to subtropical and tropical areas in South Africa, Latin America and the Caribbean. It was one of the most frequently used medications in the 18th and 19th century, according to the University of Maryland Medical Center. Acemannan is a sugar extract from the aloe plant that has been approved for veterinary use in the treatment of feline leukemia, according to The Body, The Complete HIV and AIDS Resource. However, although it is effective in animals and in the test tube, there have been no conclusive studies that show acemannan is effective in boosting the immune system in humans. Studies that have been finalized used only the single chemical compound from the plant, and some herbalists feels that use of the whole plant when producing an aloe product for internal use would be more beneficial. Some studies reported by Memorial Sloan Kettering Cancer Center do suggest that the chemicals contain some immune modulating effects that may help to improve the function of the immune system in fighting pathogens and cancer. Preliminary studies reported at the University of Maryland Medical Center suggest that aloe vera juice can help to lower blood glucose levels in people who suffer from diabetes. UMMC said more research is required to fully evaluate how this supplement can be integrated into treatment protocols. Administration of aloe with chemo therapy has had reported benefits for individuals who are suffering from metastatic cancer, according to Memorial Sloan Kettering Cancer Center. This may be because of the protective effect that aloe has on the liver, a key organ in the metabolism of chemotherapy drugs and the excretion of those toxins. In a study published in the "Pakistan Journal of Pharmaceutical Science" in 2004, research led by O.E. Etim, found that aloe vera leaf extract had a protective effect on the liver when the body was exposed to a toxic chemical, lindane. Pretreatment with aloe vera reduced the levels of serum liver enzyme markers that are present in the body when the liver is exposed to toxins that must be eliminated. Aloe juice that is derived from the skin of the aloe plant leaf has chemicals that are powerful laxatives, according to the University of Maryland Medical Center. These chemicals can produce painful cramping and the product is not recommended for use as a laxative because of the significant digestive side effects that follow. Aloe latex in the juice causes a loss of potassium in the cells lining the intestines. With continued use as a laxative, it can cause a kind of paralysis of the intestines, according to MedlinePlus. For this reason, the FDA removed laxatives that contain these chemicals from the market in 2002. When taken internally, aloe vera may cause some unwanted health issues. The National Center for Complementary and Alternative Medicine reports that side effects can range from mild issues, such as diarrhea and stomach cramps, to more severe problems that include low-blood sugar and possible hepatitis. 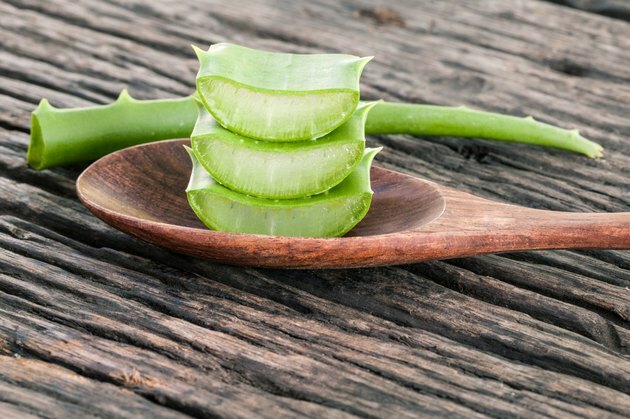 The National Toxicology Program reports that aloe vera consumption produced cancer in rat models, although no such studies to that effect have been performed on humans. The United States National Library of Medicine reports that taking internal aloe vera may lead to liver injury, often between 3 and 24 weeks after consumption. Is Aloe Juice Good for Your Stomach?